Hi friends! It's the first challenge of the year for The Paper Players, and I am very pleased to be your hostess. 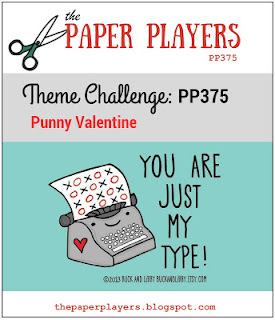 The first challenge of the month is always a theme challenge, and I've chosen "Punny Valentine". 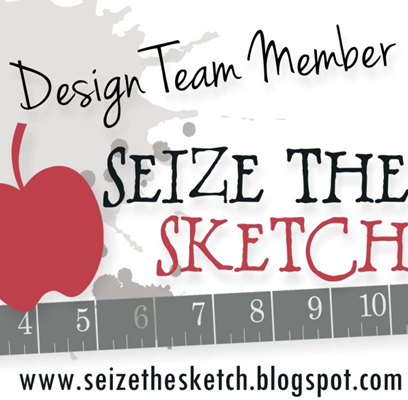 If you're not sure what I mean by "Punny", check our the work of our fabulous Design Team for some inspiration. 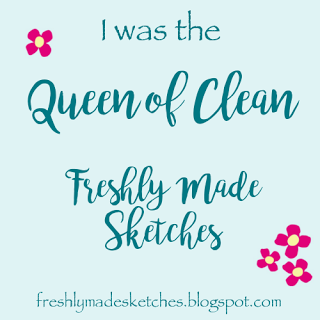 I'm quite tickled with all of their fun creations! I've always had a love/ hate relationship with shaker cards- I love the way they look and what fun they are to shake, but the contents always seem to either escape, stick to the edges or both. 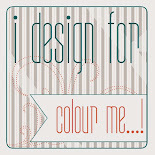 For this card I used a new tool that Santa brought me, the Fuse tool. I think this may be the solution to my problems! My sequins are nicely contained and don't stick to the edges. I see many more shaker cards in my future. Hi Sandy, a sequins pouch! Cool. We are NEVER too old for new toys. Cute card overall. 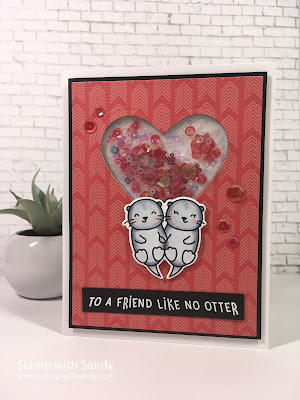 Sandy, I loved this challenge and your card is otterly adorably cute! I love that you turned it into a shaker, too! I like the pun here and the shaker element makes this card special. I'm always scared off shaker cards and your new toy sounds like an asset. Yay for more tools! Have a great week. Oh my your cute pair are otterly adorable (Sorry, couldn't resist!) Love the way they frame the shaker heart. Fuse tool? 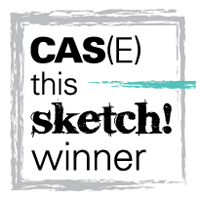 Sounds like a great new gadget - looking forward to seeing more of your fab shaker creations! What a cute shaker, and such a fun pun! I really enjoyed this challenge. 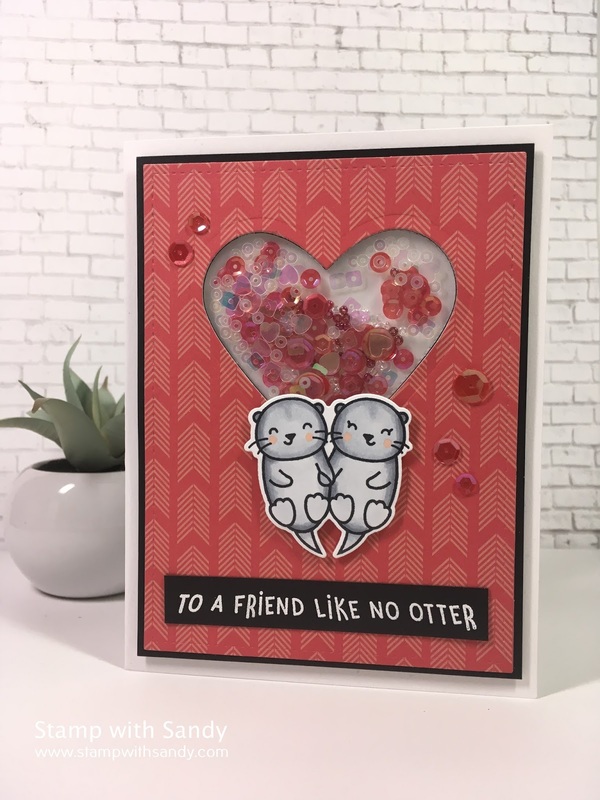 Lots of cute cards! Sorry but I have to say it too...so 'otterly' cute. I love shaker cards but haven't made too many so thanks for the inspiration and fun challenge this week. Loved it! Squeal, I love otters and these are adorable!! Great shading on them and I am curious about your new toy---gonna have to check out the Fuse tool. Love your shaker card but I am always intimidated by them too! What a fun challenge, my friend!